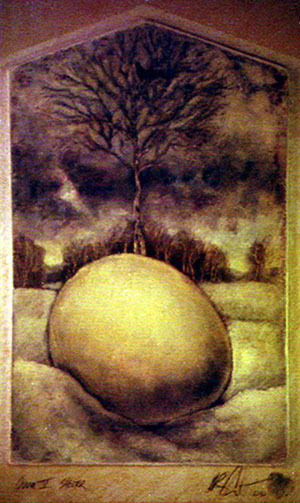 Eggs have always interested me as an artist. As a shape they are very difficult to draw because of their deceptive simplicity . The subtelty of shade and light can be maddening to capture and if drawn with even slight inaccuracy it is immediately obvious. I believe they are one of the most perfect forms in nature. Eggs are also fascinating because of all their symbolic associations. They are the beginnings of life. They are both incredibly strong and fragile simultaneously. They protect and hide the little guys inside in a beautifully contained miniature home. It is a temporary and deceptively safe shelter that provides a brief peaceful exsistence before it's border is thrown out into a whole different kind of world. The mediums used here are graphite, inks, crayon, and gesso on a gesso coated piece of masonite mounted onto another piece of painted masonite.